Belongs to the Myrtaceae plant family. It is obtained from large evergreen trees that grow up to 8 metres high and produce large leaves and small fruits. It is indigenous to the West Indies, particularly to Dominica. Leaves are collected in summer and dried whole, or as branches, for infusions, powders, and oil distillation. Bay leaves are used in cooking as part of bouquet garni and are added to sauces, soups, vegetable stews and desserts. Medicinally, bay is used to treat dandruff, sprains, bruises, and atonic ulcers. It is extracted from the leaves of the tree by steam distillation. Bay oil is dark yellow in colour and has a spicy and sweet aroma. 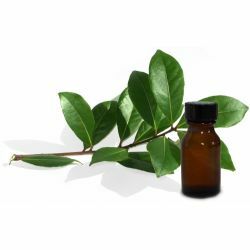 The main constituent in bay oil is eugenol. It is known to be antiseptic and warming. Aromatherapists have traditionally used bay oil as a scalp conditioner and to promote hair growth. We use bay oil in our New Shampoo Bar to condition the scalp and promote healthy hair growth.